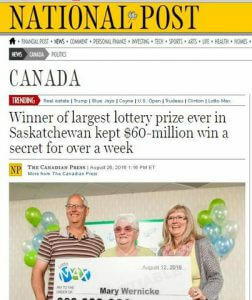 But when Mary Wernicke checked the results, she found out she had won $60 million. She retained enough of her composure to keep the win secret for a week more. Wernicke says her priority is helping her entire family; with $60 million and children, grandchildren and great-grandchildren numbering just 30 in all, she can do that handily!